Set up your dream office with these simple home office organization tips and awesome home office organizers! Home office organization is a vital part of being productive and getting things done. Below you'll find a step-by-step process for organizing your home office and everything in it as well as some initial, very important, things to consider. Enjoy and good luck! Is your home office set up in an appropriate location? This is important, because your workspace needs to be in a place that is conducive to getting work done. For example, a part of your home that is quiet and gets sunlight would be a good work environment. Furniture placement also contributes to how productive you are. I am not a Feng Shui expert, but I do know that the flow of traffic into a room or space is very important. For example, position your desk so that you can see the door when you're sitting at it. Decorating a home office is another important factor that can affect your productivity. Make sure you are surrounded by decor and other things that make you happy, comfortable and inspired. Get creative with small spaces. A home office is just that...an office in your home. Many people don't have the space to dedicate a whole room to their workspace, so get creative. For example, utilize an armoire or a closet as your home office. Here are some small home office design ideas for you. Utilize the general organizing procedure of purge, sort and store, and apply it when organizing your home office. • Start with the highest priority item. What disorganized part of your home office affects you the most? Or cleaning up what section of the office will be of the highest benefit? I find that in most cases the answer to the above questions is paper. However, paper also takes the longest to sort through, so take your time into consideration and break this down into doable, short tasks if necessary. Alternatively, you can choose to start with the next priority, because items like office supplies take less time to go through. • Once you've decided where you will start, go through each item one by one, and decide if it is worth keeping. • Click here for specific help on desk organization, organizing cords, and organizing office files (and more office organizing links are in the right column of this page). • As you make decisions, put the discards in their corresponding pile, bag or box - Recycle, Shred, Trash, Distribute, Donate. • Complete the purge by taking out the discards. • Now that you can see what and how much you have, separate your items into categories. For example, if you are getting your supplies in order, then sort them into categories that make sense to you (i.e. electronics and cords, writing utensils, paper clips and staples). I love colorful storage boxes . I use these for my home office organization! • Use your home office furniture and space to store the items you just categorized. 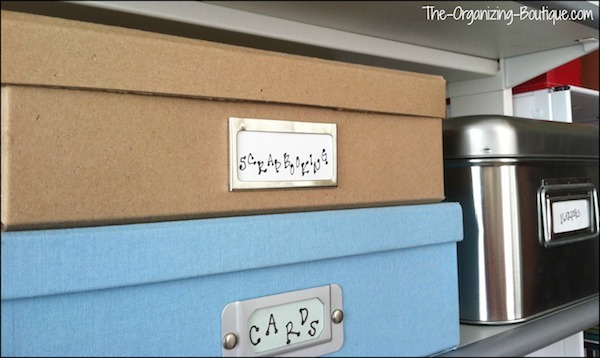 Here are specific tips on desk storage, cord storage and file storage. • Check out the home office organization product suggestions below. • One of my best home office organization tips is to take 5-10 minutes at the end of each day to put items in their proper places. This simple task will maintain your home office organization. • A few times a year, go through your home office and get rid of all unnecessary items. This keeps your work space current and ready for the constant cycle of paper and supplies going in and out. These are some of my favorite home office organization supplies. Enjoy! These boxes are colorful, sturdy and really add to the look of a home office. These magazine holders are durable and can be used to organize magazines, paper, skinny books or what have you. I love magnetic storage! These are great for storing small office supplies like pens without taking up space on your desk. Hang up a magnetic strip on the wall and voila! This file cart is mobile, holds files and office supplies and is very sturdy. I use this product as my home office file cabinet and love it. If you're looking for affordable home office furniture like home office shelving or a modern home office desk, then check out IKEA (especially their Expedit systems). If you liked this post, then check out these 10 home office organizing products. Enjoy!